This image is true 3D. It is "taken" looking down from southwest of the simulated battlefield. Again, the line of the Gettysburg / Fairfield data boundary is visible just west of Oak Ridge, and continuing to the lower right corner of the screen. 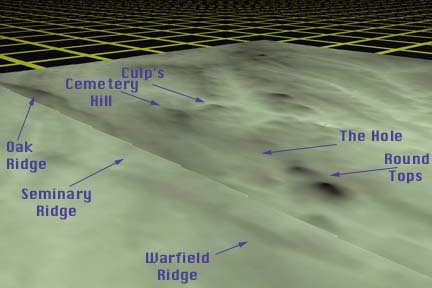 While the north-south running Oak,Warfield and Cemetery ridges are visible and real, note the stronger pattern is in a pair of ridges runing to the northeast. 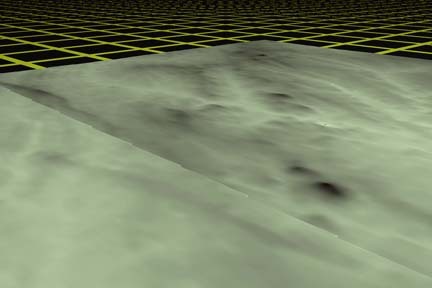 A double ridge with a valley between is clearly seen here. Most histories teach that Cemetery Ridge runs north south with Culp's and Cemetery hills on one end, and the Round Tops on the other. This is not entirely wrong. It might be at least as correct to say that the two pairs of hills are parts of two distinctly different ridge lines, with a valley between. Sickles' assigned position was the valley. Or perhaps neither description is entirely correct. Two sets of ridges intercept on the Gettysburg battlefield, and are overlaid by water erosion effects. The resulting rolling confusing terrain is indeed "lovely ground," to defend, and also for creating endless discussion among Civil War historians. The same image without text.